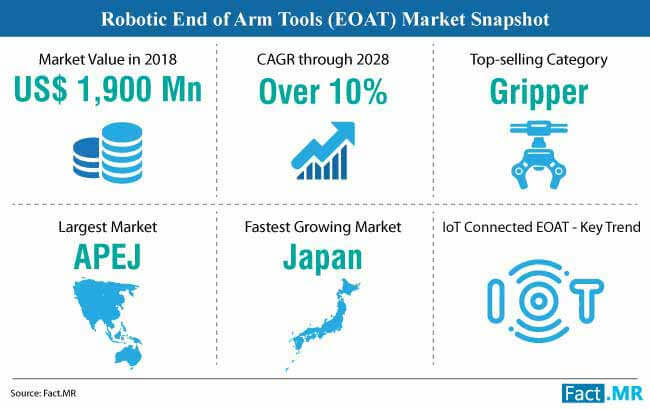 A recent research study by Fact.MR estimates global sales of robotic end of arm tools (EOAT) to surpass US$ 2,000 Mn in 2019, up from US$ 1, 900.3 Mn in 2018. This growth in sales can be attributed to the ever-evolving demand of industrial ecosystems for high productivity via industrial robotics. “As the quality of robotic end of arm tools (EOAT) is closely tied to the performance of robotic frameworks, the end-use industries are seeking lighter, faster, and cheaper models to boost their ROI benefits. This, in turn, has prompted the manufacturers in the robotic end of arm tools market space to meet diverse requirements of the end-use industries who are functioning in an increasingly competitive environment”, says the Fact.MR report. As per the Fact.MR analysis, grippers remain the ‘top-selling’ robotic end of arm tools (EOAT), with global demand estimated to exceed US$ 1,140 Mn in 2019. The demand for various types of grippers, such as jaw grippers, niddle grippers, magnetic grippers, bellows grippers, and others, varies according to the target application and associated specifications. According to the report, growing demand for grippers can be attributed to the high importance of ‘pick and place’ applications in the automation space. According to Fact.MR, demand for robotic end of arm tools (EOAT) in the automotive industry is estimated to surge, as automakers are rapidly gravitating toward robotic systems to handle complex manufacturing tasks. Automakers across the globe seek flexibility of robots to perform uninterrupted multi-tasking, which makes robotic end of arm tools (EOAT) a viable investment, both in terms of cost reduction and superlative performance. As per the Fact.MR report, APEJ will be highly lucrative region for the manufacturers in the robotic end of arm tools (EOAT) market, as the end-use industries in APEJ aim to stay at the forefront of the ‘Industry 4.0’ trend. This, in turn, is creating untapped potential for the manufacturers in the robotic end of arm tools (EOAT) market to reap sizeable profits. Flexibility, controlled pressure, and cycle times remain three among the key considerations of end-use industries while opting for robotic end of arm tools (EOAT), unveils the Fact.MR report. By taking into account the aforementioned, manufacturers are adopting a collaborative approach for successful development of products that are well-aligned with the end-user requirements. The Fact.MR report analyzes prime opportunities brimming in the global robotic end of arm tools market. As per the report, the global robotic end of arm tools (EOAT) market is likely to witness growth at a CAGR of over 10% over the forecast period.